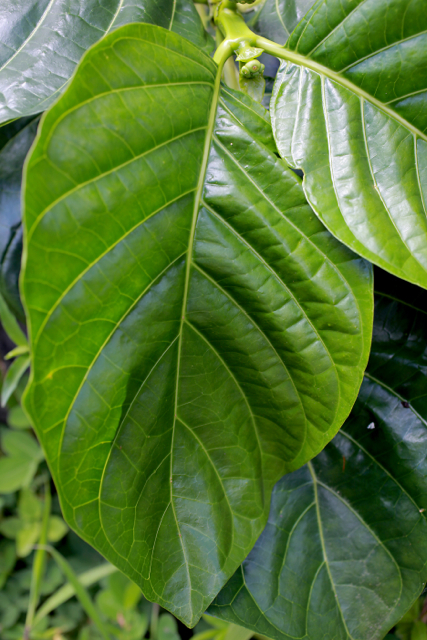 PLANT NAME: Morinda citrifolia L.
COMMON NAMES: Noni [Hawai’i, Marquesas]; hai ba ji (“ocean ba ji”) (plant), ju ye ba ji (leaf) [China]; Indian mulberry [USA]; dog dumpling [Barbados]; nonu [Samoa, Tonga]; nono [Tahiti, Cook Islands]; cheesefruit [Australia]; dilo-k [Solomon Islands]; Kura [Fiji]; nen [Marshall Islands]. STATUS IN HAWAI’I: Most of the noni in Hawai’i is Polynesian introduction. 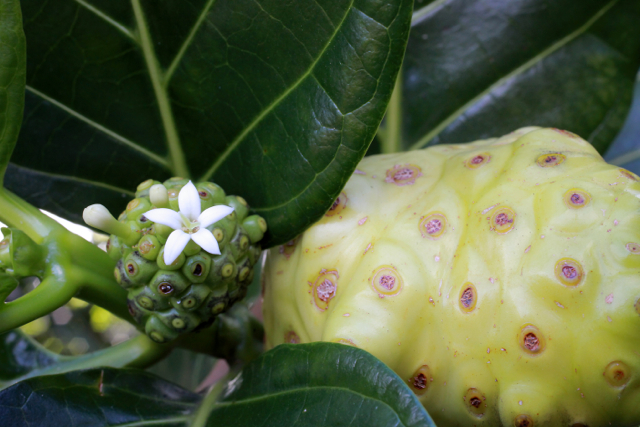 But there is an endemic species of dry-land noni called “noni kuahiwi” (M. trimera). USE AS FOOD: Only in a pinch. RANGE: Polynesia to Southern China. HABITAT: Likely native to the Northern Australia, New Guinea, and Indonesian areas. Does best at low elevations, but will grow up to 1300′. The best fruit in Hawai’i grows on hot dry lava flows near the ocean, but it does well both in the under-story and in full sun. Often found near Aleurites moluccana (kukui) and Pandanus tectorius (hala). CAUTIONS AND CONTRAINDICATIONS: Hold your nose. Due to high levels of potassium in the fruit, do not use with impaired kidney function [Mueller 2000]. Like other tonics, noni can cause gas if used to excess or in the wrong presentation. In Hawai’i, some believe noni to be the original fruit of the tree of knowledge, the “golden apple.” It is said that when Adam and Eve ate this fruit for the first time, God did not deny them its benefits, but instead modified it so that it might have an “interesting” flavor [Ronnette Gonsalves].